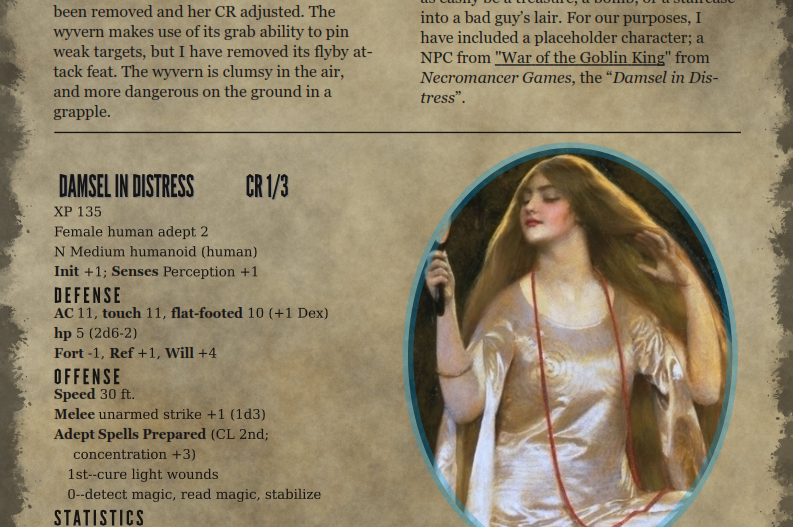 This PDF includes an encounter with two flying creatures who use different tactics, and the rules a GM will need to run this encounter. I have included summaries of the monster's abilities in their stat blocks, and descriptions of feats, flying and swimming rules, and a few pictures for color. I did this because my adobe subscription expired, so I wanted to learn an open source program. I made this with Scribus, which is less elegant than I am used to, but powerful and effective. I think I did a pretty good job in just a few hours of learning a new program. In keeping with the open source theme; this PDF is free to use, copy, reprint, or blow your nose on. You can download the printable version, or you use the version with a fancy background.